This review is about item#7169197. Attach and reattach car emblems and interior items. It is of reasonable width and uses it in necessary width. It is useful and easy to use. Adhesion is also perfect. I did all the work with double sided tape! Adhesion is perfect. 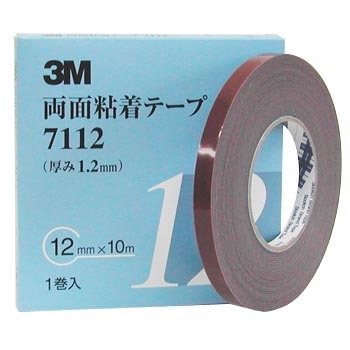 This length, thickness, width double-sided tape is good because it sometimes does not sell at home center etc. This review is about item#7169181. I used it for an emblem, it is 3 M of stability. It is not cheap. Used for full aero fixing, the length of the tape (10 m) is just right, after one month passed, it is fixed without problems. The problem of hooks sticking to the wall fell off when it passed for years Although it may be that it uses a considerable effort to peel off the base material of the tape by deteriorating with time due to collapse of the base material of the tape, this tape can be reliably used and used around bathrooms and kitchens where the temperature and humidity changes intensely All the tapes attached at the time of purchase are peeled off and replaced. Compared to 2 m volume in ordinary supermarkets etc. For business use price per length is cheap From being easy to use, if it is a hard surface it can be easily peeled off without unpleasant residue In addition to hook attachment, we are using it easily to paste materials and photos. Since the adhesive strength is strong, even a light one can be pointed well enough and post-processing is easy I think that it is actually more effective than the paper base double-sided tape normally used. It is very handy for ETC, navigation, and other installation. This review is about item#7169206. Car exterior installation Adhesion was also good without problems. Since the adhesive force of the PP molding mortar tape was insufficient Although it used, it was too wide at 12 mm width and cut it in half I used it. Next time I will try using a tape with a narrower width I am thinking. Matching with primers was good and I was very satisfied. As expected, the adhesion is also strong and satisfactory. It is a reliable quality with proven track record in automobile manufacturing. Weather resistance, temperature resistance, adhesion are particularly excellent. This review is about item#07169181. Sticky, good a little more cheap. This review is about item#07169224. 3M goods There is no problem. This review is about item#07169206. This review is about item#07169197. This review is about item#07169215.